Emergency Declaration For Border Wall Could Tap Military Funds A 1982 law empowers the secretary of defense to redirect military construction funds during a presidentially declared national emergency. 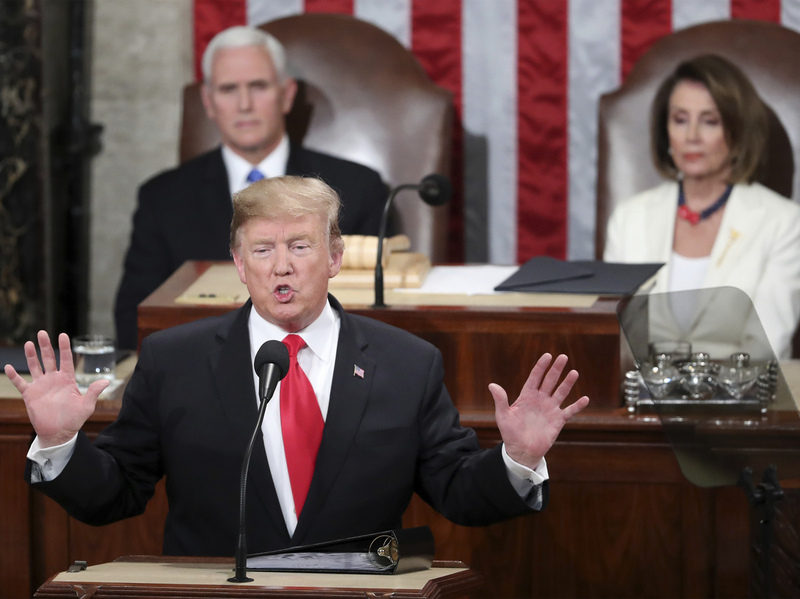 During his State of the Union speech this month, President Trump reiterated his call for funding of a wall to block unauthorized migration across the Southern border. After weeks of brandishing the threat of invoking a national emergency, President Trump is going ahead and declaring one. "President Trump will sign the government funding bill," White House spokeswoman Sarah Sanders said Thursday afternoon, "and as he has stated before, he will also take other executive action — including a national emergency — to ensure we stop the national security and humanitarian crisis at the border." Trump had earlier declared his unhappiness with the $1.375 billion that Congress is providing for a border barrier in a spending bill that keeps the government operating through the end of September. That outlay is less than a quarter of the $5.7 billion Trump had sought for a wall along the border with Mexico. By declaring a national emergency at the same time he signs the legislation keeping the government open, Trump is aiming to amass additional funding for that wall from what acting White House chief of staff Mick Mulvaney has called "pots of money" in federal agencies. A possible source for fattening border wall funding would be the billions of dollars appropriated this year for military construction. A 1982 law empowers the secretary of defense to redirect military construction funds during a presidentially declared national emergency. But tapping money meant for building military housing or improving safety on bases could be problematic. "You can use military construction funding under a national emergency, but it actually stipulates that that has to be for a military purpose, and it would be hard to justify this, I think, is a military purpose," says military budget expert Todd Harrison of the Center for Strategic and International Studies. "So if [Trump] did that, he's likely to end up with a court challenge, which could forestall the whole thing for months or even years."